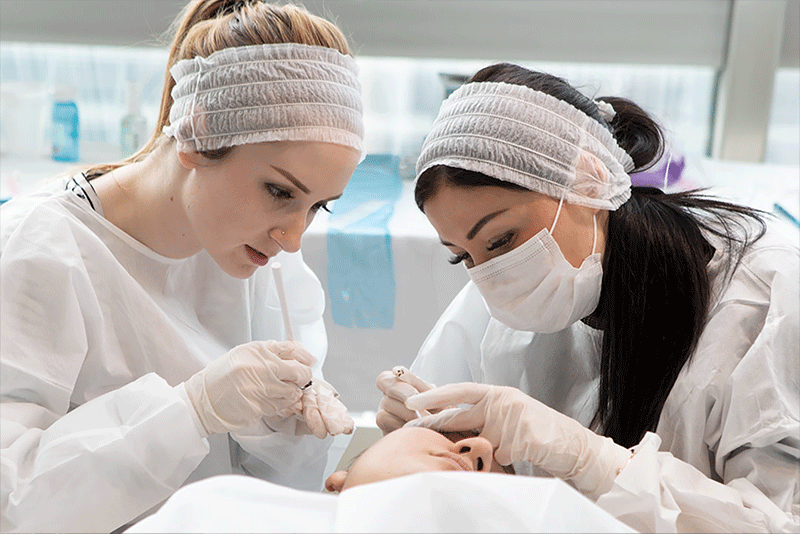 Learn one of the most in-demand semi-permanent brow treatments at Eye Design University! Our first-ever Powder Effect MasterClass was a success, and we want to share all the details with you. Couldn’t make it? Details on our upcoming classes are inside! One of Eye Design’s most exciting events of 2019 is in the books! Thank-you to all the wonderful students who attended our first-ever Powder Effect MasterClass. Our team loved getting to see some of our microblading and lash graduates, as well as a few new faces! We hope you enjoyed it as much as we did, and we cannot wait to see the work you do in the future with your NEW Powder Effect (microshading) skills. Couldn’t make it to MasterClass this time around? The Eye Design University team definitely missed you! But, we are happy to fill you in on what you missed (and provide more details on upcoming classes). All beauty professionals should make it a priority to learn the Powder Effect technique. Also known as shadow effect, ombré brows and microshading, Powder Effect gives clients a gradient shaded makeup look. It is ideal for those who have medium-to-full natural eyebrow hair who want shape, definition and an overall bolder brow. Powder Effect can also be combined with microblading for the ultimate Hybrid brow. One in three clients can benefit from Powder Effect, meaning you can increase your income as a beauty professional by 30 percent! When done correctly, it is a safe and gentle technique suitable for those with sensitive, oily or mature skin. Downtime is minimal–much shorter than microblading. In just three days, Powder Effect clients can return to their normal routines! Pigment can last under the skin for up to three years, however, we recommend clients come every 12 to 18 months to keep brows looking fresh. Powder Effect is extremely versatile. Our MasterClass teaches you how to achieve results for clients who prefer an extremely high-impact makeup look, as well as those who want a soft, subtle ombré. Eye Design’s founder and Master Technician Nadia Afanaseva developed three main pigment application patterns for Powder Effect, all of which can be slightly changed to fit each client’s personal preferences and unique brow shapes. At our Powder Effect MasterClass, you will learn how to use each of these techniques to give your clients beautiful results! Day 1 begins with the theory behind Nadia’s exclusive techniques. We also go over essential information such as skin tones, undertones and types, and students go home with a detailed information booklet. The day ends with a live demo, so students can see our most talented and experienced technicians up-close as they work. On Day 2, students focus on drawing methods. We teach our exclusive 5-point drawing method. Students practice first with pencil and paper, then with a machine tool on artificial skin. Our technicians guide you in creating different eyebrow shapes and pigment application patterns. Perhaps the most exciting day is Day 3! Students who opt for our Platinum package partake in live-model practice. Each Platinum student receives two lives models, chosen by the Eye Design team. Our team carefully reviews each model submission to assure all of those who are chosen are perfect candidates for Powder Effect! We book each model for four hours so that you can take your time; we never want you to feel rushed. Live-model practice gives you real-world experience. You will have the opportunity to take before and after pictures of each model to grow your portfolio! Add them to your website or your social media feeds so clients will know you trained with the best. Eye Design’s next Microblading MasterClass will be held in May in New York City. Our next Powder Effect MasterClass will be in June (tentative) in NYC. For more information or to enroll today, call Eye Design University at (917) 708-8870.